Recently Apple has been in the news a lot, but unfortunately not for the legacy of Steve Jobs or the newest iPhone model. Media outlets are instead recognizing the company and its sub- contractor, Foxconn for maltreatment of its Chinese labor force. 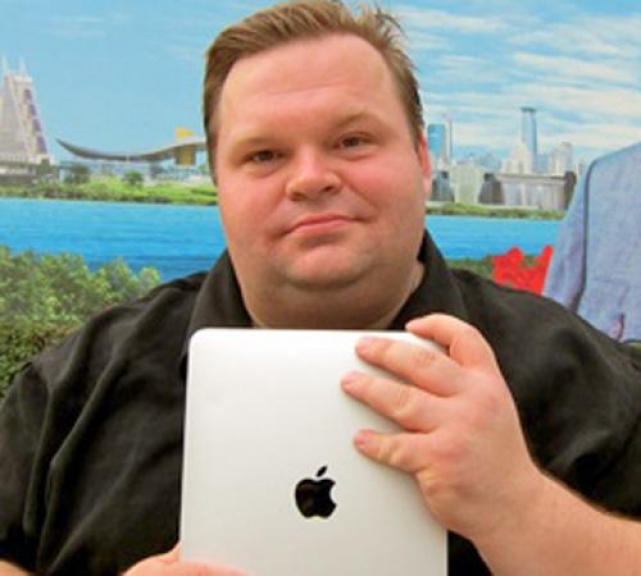 In January Mike Daisey, a comedian and self described Mac user, was featured in This American Life episode 454 where he, as a curious consumer decides to visit the Foxconn factory in Shenzhen, China, interview workers and try to get a better understanding of how these products are really made. Since then several other news outlets have covered this topic from NPR’s Tell Me More broadcast on February 7, to alternative websites like Grist, a site focused on green news, which posted an editorial piece called From Earth to Apple: Think Different about Profits. The article advocates not only for better labor laws but also for updated environmental standards in the development and manufacturing stages of Apple materials. As Apple products certainly lead in producing high quality ICTs, our blog is concerned! Countries in the global north are prominent consumers of Apple products and other technological gadgets we lovingly call ICTs. While Apple and other Western owned corporations continue to design and profit from their increasingly popular products much of the manufacturing and assembly occurs abroad. Many Americans know electronics are ‘Made in China’, but fewer know the details of how this manufacturing takes place, or the conditions in which these workers create the products. Shenzhen is a city in China, which has really sprouted, some would say artificially, as a center for these companies. Foxconn, a sub-contractor of Apple, manages its operations within this context, and has taken much of the heat in recent months, as the spotlight shines on the labor conditions of their facility. 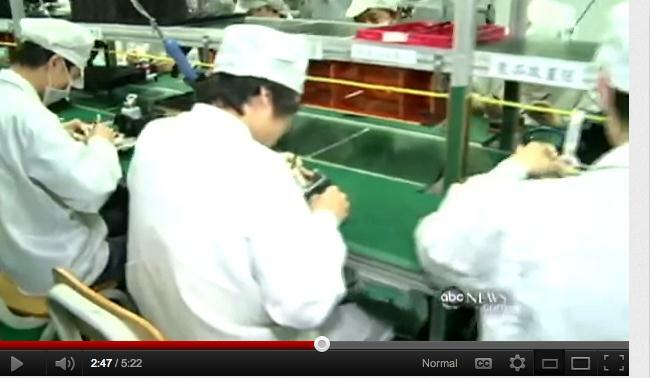 In the flood of press, some investigative reports have recently visited Foxconn to bring us the “inside story”. Bill Weir, who’s report was featured on ABC on February 20th aims to expose the viewer to the reality of living and working conditions for these employees. The video, entitled A Trip to The iFactory: ‘Nightline’ Gets an Unprecedented Glimpse Inside Apple’s Chinese Core is linked below this image. In studying international development it quickly becomes clear that neo-liberal economists, through institutions like The World Bank, still maintain hegemony over policy decisions and options for economic growth in the global south. Their ideology is based on the notion that a capitalist free-market will always bring about the best products and outcomes, because companies do their best work, competing for the choice of consumers. But in reality there are endless examples of companies, which put profits first at the expense of consumers, their workers, and the environment. The focus on profits usually undermines any concerns that third world economies “compete” from extremely inequitable and exploited positions. Most economists would argue poor countries are poor because they lack innovation, or the work ethic that successful economies have flourished from. The road to success is based on the notion of meritocracy—those who work hard get rich—and they deserve that wealth. Their profits are a medal of their success, and always serve the best interest of the whole economy. So how about the laborers in developing countries? A common neo-liberal argument is that workers are happy to have any job, even one in sweatshop-like conditions—it’s a better alternative than the poverty they would experience without that industry and the jobs it brings. There is some truth to this statement, shown in the Bill Weir video, where hundreds of people have traveled long distances to reach Shenzhen and wait, eager for a job at Foxconn. I am coming to terms with the fact that my initial questions often come from perhaps a naïve place, and from my slightly socialist-leaning perspective. But I am certainly not alone in asking these questions. In fact all of the media pieces featured above bring related issues to the table. What is the human cost of Apple profits? Why do corporations claim they cannot absorb more production and labor costs while they make record profits? As the Grit editorial notes, Apple’s assets have recently climbed to a mind-boggling $100 billion. Compare this to the costs of labor for IPhones, which make up only 2% of the equation. What role should corporations play in creating dignified working conditions? If we break down the numbers, we know that at least in Apple’s case they have the capacity invest in better labor conditions. The question is, are they willing? Most recently in following these developments we see that a critical mass of consumers can act as whistleblowers and can hold even powerful companies accountable. Ironically, we know that consumers have proliferating access to information about labor conditions in our globalized world, often finding this information through the very ICT products that are made in these oppressive factories. The NY times recently reported that Foxconn has decided to raise worker wages and reduce over-time hours. Will the consumers absorb this cost of the change or the corporation? Companies are making concessions but arguably still acting out of self- interest to protect their profits—does this matter? How can more equitable business practices play a role in international development and the expansion of ICTs? As dialogue circulates on labor practices in China, we are not only seeing effects of the ICTs industry on employment, but witnessing a kind of informal education. As we read articles and blogs, discuss the ethics of business practices and consider global economic power dynamics, we are not only following media, but educating ourselves to be critically engaged consumers and citizens.